Kate McAleer, Owner and CEO of Bixby & Co, announces the introduction of a line of chocolate Puffins at the 2018 Fancy Food Show at the Javits Convention Center in New York City (June 30 – July 3, 2018). 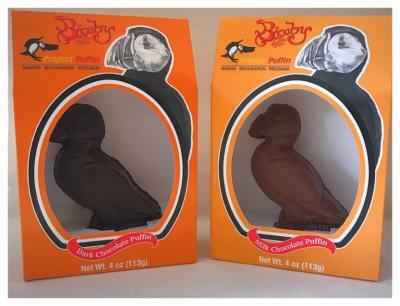 The Puffins come in molded 3-D figurines (4 oz), Vintage Puffin Bean to Bars (2 oz), and Puffin Pops (1.5-gram Puffin lollipops. The 3-D Puffins and Puffin Pops come in dark and milk chocolate options. A dark chocolate “Vintage Puffin” flat bar made directly from the cocoa bean to the bar has been created. Atlantic Puffins were essentially lost from Maine by 1900 due to excessive hunting, but now about 6,000 pairs nest from the Canadian border to mid-coast Maine. The resurgence is due in part to the work of the National Audubon Society’s Project Puffin that has restored colonies in mid-coast Maine over the past 40 plus years. Maine is the only state where this iconic species nests and Puffin watching trips are an increasingly popular tourism attraction. Puffins are now protected by U.S. law from hunting but even greater threats loom. Climate change, predation, and human interference continue to threaten these birds’ survival. “The puffins are simply breathtaking and adorable to see in the wild,” said McAleer. “As a proud sponsor of Project Puffin, we help support the vital conservation work of the National Audubon Society to protect birds and the places they need, today and tomorrow,” McAleer added. The Puffin series is on display at the Bixby & Co. booth (4127).